Love him? Hate him? Sack him? Keep him? Let your opinions be known, right here. 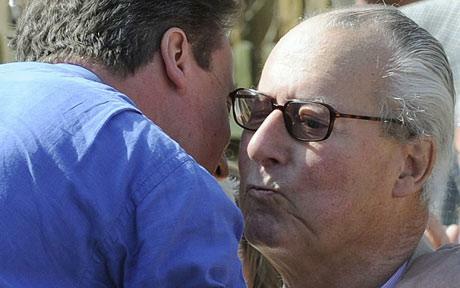 The Prime Minister’s father, Ian Cameron, passed away from heart complications following a massive stroke, today. He was 78. Ever the hero in the eyes of his son, David, Mr. Cameron was a source of hope, love, compassion and endless supplies of optimism. He is the man the Prime Minister credits with instilling that same optimistic outlook in his children. Born with a severe physical disability in his legs, Ian Cameron struggled from an early age to cope with the pain and suffering caused by his deformity. Mr. Cameron overcame his disability. He lived a life full of the rich rewards of a loving family, was a successful stockbroker, and left this world with few regrets. His steely, determined glare at adversity gave his children courage, perseverance and obstinacy. Three key ingredients, as it happens, that make a man a Great Man. There can be little doubt that those values – learned at his father’s knee – will see him fulfill his charge to lead the people of Great Britain out of the cold damp darkness of recession, into the rich, abundant Tory Blue skies of Ian Cameron’s Big Society. Peace be with you, Ian. The Indy is reporting on the new probe that is to be launched following evidence given to the Home Affairs Select Committee, this morning. The inquiry will focus on the police response, the ease of prosecuting such offences, and the treatment of victims after it emerged the New York Times refused to co-operate with British police looking into allegations of phone-hacking made by the newspaper last week. Mr Vaz said: “The evidence of Assistant Commissioner John Yates today raised a number questions of importance about the law on phone-hacking, the way the police deal with such breaches of the law and the manner in which victims are informed of those breaches. The inquiry is said to be looking at – among other things – the manner in which victims of phone-hacking are handled by the police. It is hoped that this will provide some clarity regarding how the police conducted the previous investigation, which resulted in the arrest of a News of the World reporter, and a private investigator. The previous investigation also led to the resignation of Andy Coulson, former editor of the News of the World, now Director of Communications at Downing Street. There is a growing faction of Tories in the Westminster village who are calling for action against Mr. Coulson. It has been suggested that a fresh inquiry – and Coulson’s willingness to speak with the police – will quiet some of the more outspoken members of the group calling for his resignation. John Prescott has been sighted at several of Shanghai’s best restaurants recently, as he continues on his speaking tour of the area. The self-appointed man of the people stands to make (and/or gain) not a few pounds from the deal. No doubt when he arrives back home to Hull, he will distribute it among the poor in – say – Manchester, where Greater Manchester Police have ruled that officers in the city will not be allowed any unofficial radios or televisions on which to watch the World Cup. But, where are those quiet moments? We thought they only spent about 13% of their time out fighting crime because of the vast mountain of paperwork they face every day, not waiting around for baddies. Gripping stuff, don’t you think? Is Twitter good for democracy? An interesting stab at the subject, this morning in the Independent by John Rentoul. Perhaps a bit hyperbolic, considering there was excellent, substantive political discourse and commentary prior to Twitter, the Internet – hell, even before the computer. Call me a heretic if you wish, but it’s true. What makes Twitter unique, found Korean scientists (South Korean, presumably), is the wild-fire manner in which it spreads information. Researchers at the Department of Computer Science at the Korea Advanced Institute of Science and Technology have studied Twitter and decided that it is a news medium more than a social network, but the joy of it is that it is both. I use it to keep in touch with other political journalists, politicians and other people who are interested in politics. The joy of it is its connectedness. The Korean researchers found that the average degree of separation between any two Twitterers is four. That is, information needs to pass through four hops to get from anyone with a computer or mobile phone anywhere in the world to me, from follower to follower, to someone whom I follow. We’re not so sure, though, that is does actually qualify as a news service, per se. For one thing there is no burden of verification, no accountability – apart from perhaps being ostracised by your peers. Mind you, it does provide a great deal of information to the general public that allows them to make good decisions based on reasonably verifiable information. That, of course, is one of the most important jobs of a free press; to give the public the information needed to take educated political decisions in order that they may live in a free and democratic society. But then again, sometimes Twitter is more like a massive online Letter to the Editor. Except, it’s self-publishing, and self-propagating (to a certain extent). That’s not news, though it is commentary. In many many cases it is very good and learned commentary, but commentary nonetheless. Most of the time, however, Twitter is like a news service. It is different from social networks in that links are not necessarily mutual. People can choose to follow each other, but the Korean research found that four-fifths of links were one-way. This means that hub Twitterers with a lot of followers act as diffusers of news. When I started on this newspaper as a political reporter in 1995, the main source of UK “breaking news” was the Press Association wire – short bulletins of news, as it happened. Now Twitter fills that gap, as journalists and citizen-reporters let each other know when someone has left their microphone on, or has ruled out standing for the Labour leadership. When Adam Boulton started to lose his temper with Alastair Campbell on live television during the post-election negotiations, people tweeted to tell others to put Sky News on – to catch the best bits. William Hague announced that the talks with the Liberal Democrats were back on on Twitter. It is a way for politicians to speak to – or beyond – the conventional media. But it also offers journalists other ways of reporting. Ding! Yes, it does offer a pretty unique tool to journalists. A good and important one at that. It’s free. Freely available. Used at the popular level. Subject to the editorial opinion of the reading public, but free of the corporate editorial line – to some extent. It may just be one of the most important – and simple – defenders of freedom and democracy since the blog. We’re watching SkyNews. They seem to think George Osborne is Chancellor, now. Was there an election? We went into hibernation, focusing our considerable attention on Twitter for the duration – mainly because nobody reads this blog, and because we’re not so self-important to think anybody would want to, anyway. But, it does seem that a breath of fresh air has swept through Whitehall. The Cameron-Clegg coalition actually does appear to show promise – and not just promise that is carefully engineered to appear hopeful. We think it actually is hopeful, and reasonably so. It does seem to go beyond spin. We asked Paul Waugh of the Evening Standard whether he thought the CamClegg relationship reflected chemistry or tension. Waugh replied almost immediately – chemistry. As we await the emergency budget – on June 22 – and watch as CamClegg continue to fulfill the hopes and dreams of a nation battered by intrusive, incompetent and arbitrary government, we do so with a sense of expectation, and hope. “Britain is once again open for business” were the closing remarks from the Chancellor, this evening. It implies, of course, that Britain was closed for business. Indeed, it was. Following the massive fiscal cockups of the Labour regime for the past 13 years, and the consequences that will be felt from those for years to come, let’s hope George can pull off a hat-trick. If any government could do it, based on the momentum they appear to be continuing to build, this one can. Boo to Nanny. Go team. p.s. We know the blog header needs to be changed, now. Tomorrow we have the chance to change Britain for the better. But this election is very close and we need all the support you can give in the time that’s left to make that happen. We have just 24 hours to choose a new government led by David Cameron and save Britain from five more years of Gordon Brown. Only by voting Conservative tomorrow will you get a new government that starts cleaning up the mess on Friday. A vote for the Lib Dems is a vote for five more years of Gordon Brown. William Hague sent you this video yesterday about the last thirteen years under this Labour government. If you can think of any friends who need to be reminded about their record of failure, please click here to send this on to them. David’s energy, leadership and values have really shone through in this campaign. As I write, he has been on the campaign trail for almost 36 hours non-stop, right through the night. Nobody has campaigned harder than him. During this political marathon he has travelled across England, Wales, Scotland and Northern Ireland, and done an overnight bus tour to talk to groups of night shift workers. His final rally speech will be in Bristol at 6.30pm, so don’t forget to watch it on TV. This tour shows that this campaign is all about winning door by door, street by street, constituency by constituency – and we need you to get out there and fight for every last vote. But if you’re not able to get out onto the streets or do some telephone canvassing, you can still do you bit online to make a difference. As well as forwarding this email on, please tell your friends on Facebook and Twitter why you are voting Conservative, and please donate online to pay for last minute leaflets and online adverts. The election moment we have been waiting for these last thirteen years is upon us. Together, if we work hard, we really can bring the change Britain needs.